The Skinny: Batman gets the manhua treatment via Hong Kong's "Comic King." Great artwork from Tony Wong almost makes up for the weak storyline, but not quite. Does the name Jademan Comics ring any bells? Some comic fans might recall a mustachioed entrepreneur named Tony Wong who introduced a slew of Chinese comics to the American public in the late 1980s. His company Jademan released English language reprints of such Hong Kong fare as Oriental Heroes, Drunken Fist, Force of Buddha's Palm, and Ma Wing-Shing's Blood Sword. 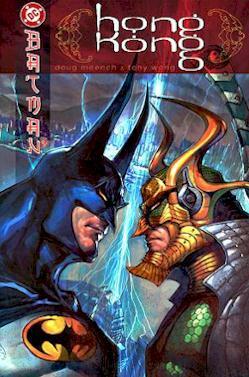 After some initial popularity, the public's interest in Chinese comics waned, and Jademan ceased publication in the United States. Recently, however, Hong Kong manhua has experienced a resurgence of sorts when ComicsOne began releasing popular HK comics like Weapons of the Gods, Mega Dragon and Tiger, and Storm Riders to American readers. Perhaps inspired by this, DC Comics hired Tony Wong to try his hand at drawing one of the company's flagship characters: Batman. Artistically speaking, the union between Tony Wong's Hong Kong style and the Dark Knight Detective is a proverbial match made in heaven. But from a storytelling standpoint, the partnership leaves something to be desired. The story opens in Gotham City as a computer geek just happens upon an authenticand livesnuff film while surfing the net. The hacker watches helplessly as the victim is murdered right before his eyes. The following morning, the hacker immediately reports the incident to the police, but Commissioner Gordon tells the man that until a corpse turns up, there's nothing to investigate. Things start to perk up when a bum finds the body of the poor soul killed in the private webcast. Upon learning that the film wasn't a hoax, Commissioner Gordon calls on the one person that might just be able to solve the case: Batman. Fearing that the hacker might be in danger, Batman races to save him, but sadly, our hero shows up just moments too late. At a seeming dead end, Batman gets a break when he learns that a similar murder has occurred across the Pacific in Hong Kong. Ol' Bats, along with his trusty butler Alfred, boards a plane and heads to the Far Eastsans costume of course. Thanks to Jim Gordon's connections, the Dark Knight is able to meet with HK Police Chief Chow Yee to discuss the particulars of the case. The meeting proves fruitful; the clues seem to point towards the villainous Tiger One-Eye, a triad leader half as pretty and ten times more powerful than Chan Ho-Nam. But after busting some Triad flunkies' heads, Batman is no closer to the truth. That is, until he meets Benny Lo, a former gangster whose partner was killed in the same manner as Gotham's snuff film victims. Inspired by Batman, Benny dons a costume and begins calling himself Night Dragon, teaming up with Bats to solve a mystery that unbeknownst to both has roots in Benny's own past. First, the bad news: I'm sorry to report that Batman: Hong Kong is NOT longtime Batman scribe Doug Moench's best work. In many cases, the dialogue is simply overwritten: it's too obvious, wordy, or just plain melodramatic. Comics are a visual medium, and it's a shame Moench didn't trust the pictures to do the talking. But then again, considering the quality of Moench's past work, one wonders how much input he had in creating this project. Whatever the case, a lot of the better ideas in the story aren't executed very well. One interesting aspect of the story that is undermined by the writing is the whole idea that the vigilante Night Dragon finds himself caught between his two unclesone a cop, the other a crookfrom both a literal and philosophical perspective. But sadly, that point is so belabored by the dialogue that any intended poetic resonance ends up getting lost in a mountain of exposition. Also, sloppy departures from the basic tenets of realism sometimes strain the narrative. While I'll admit that a man dressing up as a bat to fight criminals is in itself not the most realistic of concepts, I can't help but be annoyed with the idea that Benny Lo could construct an elaborate, armored costume in the course of a single day. Sure, Night Dragon's golden nunchaku and Storm Riders-style blade are pretty neat, but where did they come from? Did Night Dragon just have them lying around the house? Did he pick them up from the Acme weaponry store? At least with Batman, we've been told he's spent years honing his skills and amassing all his wonderful toys, but it seems too big a leap to think that Night Dragon can transform into a full-fledged crimefighter on par with the Dark Knight in less than twenty-four hours. But as I mentioned before, comics are a visual medium, and consequently, the saving grace of Batman: Hong Kong is the artwork. Tony Wong's take on Batman is striking, and bears a slight resemblance to the work of legendary Batman artist Neal Adams. Additionally, Wong's Batman has the long bat-ears seen most prominently in artist Kelley Jones' Batman as well as an oversized, creepy cape that's reminiscent of Todd McFarlane's Spawn. But even with these familiar touches, the overall style is all Wong (and his assistants, I presume). Ultimately, the Hong Kong method of mixing in traditional penciled art with full-color paintings results in a series of memorable images. However, if there's one complaint I have about the art, it's the limitations imposed on Wong and his crew. Part of the appeal of Jim Lee's popular run on the regular Batman title was the sheer pleasure of seeing his take on the classic villains from Batman's rogues' gallery, i.e., the Joker, Killer Croc, Catwoman, etc. Here, the Hong Kong setting simply doesn't allow for that. But supposing Batman: Hong Kong does well, there's always a chance Tony Wong will get the chance to tackle the Joker in a sequel.